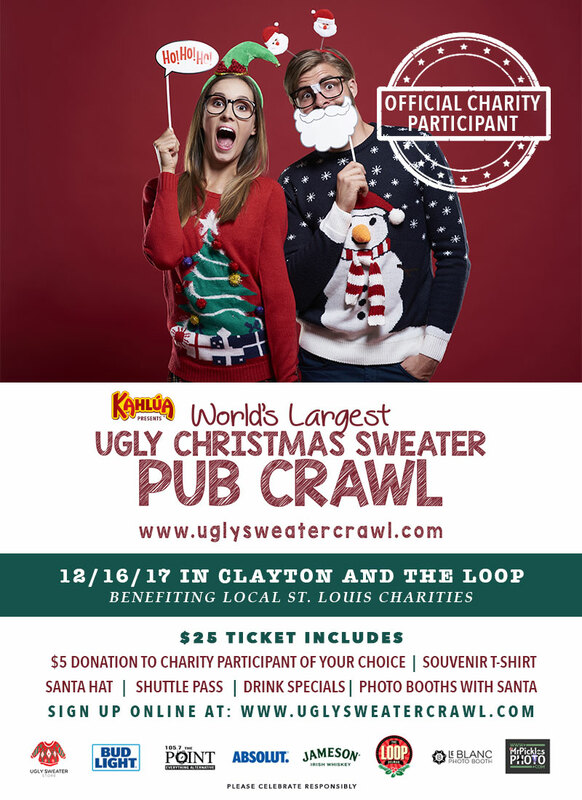 The 3rd annual World’s Largest Ugly Christmas Sweater Party is back and moving to the City of Clayton and The Loop for a two city pub crawl benefiting 5 local charities during the holiday season. This year we expect over 2,500 guests to come together in their best holiday attire to raise over $12,000 for our local charities….may we suggest an Ugly Christmas Sweater! The event will take place on Saturday, December 16th from 8pm to midnight at 10 plus bars and restaurants in the City of Clayton and The Loop. Shuttle buses will be taking guests to both cities from 8pm to midnight. Dress in your favorite holiday attire..Ugly Sweaters encouraged but not needed and join thousands as we take the street to raise money and awareness for 5 local charities. When you purchase your $25 ticket, you must sign up under one of the four charities so we can donate $5 back to them before Christmas. $5 Donation to Hope For Young Adults With Cancer! Once you purchase a ticket, $5 goes directly back to Hope For Young Adults With Cancer!